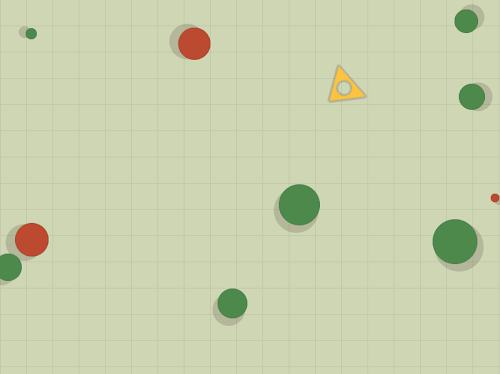 Gameplay: there will be two types circles (red, green). They will it each other Osmos (http://www.hemispheregames.com/osmos/) style. You will control triangle. You will need to collect smaller circles and shoot them into bigger ones by splitting them into smaller ones. Winning/Losing? I do not know – I just want to test and implement this game mechanics. Rant. This time I am trying to make my first pygame game. And it is frustrating. I've already few times caught myself thinking: "Screw this. Let's take pyglet, drop to opengl level and be done with this.". Just curious, why did you decide not to use pyglet? Nice shadow idea. I am also playing with circles. Is it lack of sportsmanship if i steal that idea? @Cosmologicon: Two things. First, I've never created game with pygame. Never. Second, in previous PyWeeks I got a lot of DNW on scoring. Hopefully, I will see if pygame changes that. Hopefully, because first I need to do one really small and easy thing – make a game. @lucio: It is not stealing. I am not holding patents on circles or anything. Please, feel free to do anything you want.